Designed as a quick reference tool and an easy-to-use study guide, this inexpensive and up-to-date book offers fast, effective communications. 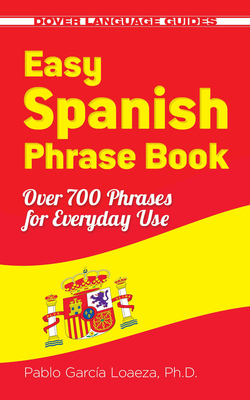 The perfect companion for tourists and business travelers in Spain and Latin America, it features words, phrases, and sentences that cover everything from asking directions to making reservations to ordering dinner. Over 700 conveniently organized expressions include terms for modern telecommunications as well as phrases related to transportation, shopping, services, medical and emergency situations, and other common circumstances. A phonetic pronunciation accompanies each phrase. Pablo Garcia-Loaeza is an Assistant Professor of Spanish at West Virginia University, where he specializes in Latin American literature and culture. He is the author of four other Dover Spanish Language titles.